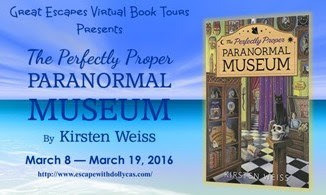 Kirsten Weiss, author of The Perfectly Proper Paranormal Museum is here today to answer all of our questions about her writing process and her new book. I love, love, LOVE Charlaine Harris’s new Midnight, Texas series. I think she went back to her roots with this book – the paranormal isn’t quite so obvious, and the characters and setting are quirky and fun. Sure! Maddie’s a small business owner, like me. She’s a fan of pizza and burritos, so lunch would be easy. And more importantly, she’s a smart, kind person who is loyal to her friends. (Even if she does occasionally give them a hard time). Edgar Allan Poe. I’m fascinated by his poetry and his prose. He had a handle on words and rhythm that astounds me. It took me about two months to write, two months to ferment, and another two months to edit, but I wasn’t working at any of that full-time. As to the fermentation-phase, I like to set my original manuscript aside for two months before I start editing. That way, I can get some distance from it and see what needs fixing more clearly. There are a surprising number of paranormal museums around the US, and most of them have websites. 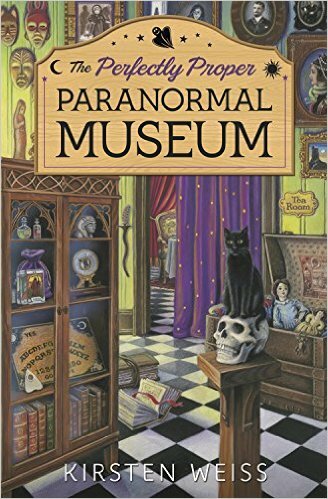 But I also did research on what sort of historical objects might be in the museum, particularly from America’s 19th century spiritualist movement. The 19th century was a wild time for mediums and scientists trying to measure paranormal activity. Many unusual artifacts came from that period – from talking boards to spirit cabinets. Thank you for a great Q&A, Kirsten! Thanks for the opportunity to be interviewed! I really enjoyed it!